The Miracle-Gro AeroGarden 7 is the one that started the indoor gardening revolution! It’s a simple, attractive indoor garden designed to be easy-to-use while delivering high-output at a lower cost than our more fully featured gardens. Perfect for kitchen counters or any indoor growing, the AeroGarden 7 combines NASA-proven growing technology with our 2 bulb, 50 watt CFL grow light hood. The AeroGarden 7 sets up and plants in minutes to deliver big yields and fast, healthy plant growth. Use it to grow fresh herbs, salad greens, cherry tomatoes, flowers and more up to ten times faster than plants grown in soil. The AeroGarden 7 clicks together in minutes with just four easy parts. Planting is a snap, just drop in the pre-seeded grow pods, add water and the included liquid nutrients, and plug it in. Depending on variety, your plants can germinate in days, begin harvests in just a few weeks, and keep producing continuous harvests for up to 6 months. The control panel tells you when to add water and nutrients, and even turns the grow lights on and off to maximize growth. Indoor gardening can’t get any simpler! What good is space-age technology if you don’t get warp-speed growth? The AeroGarden is the fastest growing method we’ve ever tested. In fact, in numerous tests, our AeroGardens averaged up to 10 times faster than plants grown in pots in high quality potting soil. That’s 10 times more basil! 10 times more lettuce! 10 times more fun. Sure, AeroGardens are easy, but what good is that if it doesn’t produce. An AeroGarden 7 can produce $150 worth of fresh basil in just four months compared to buying it at the store. 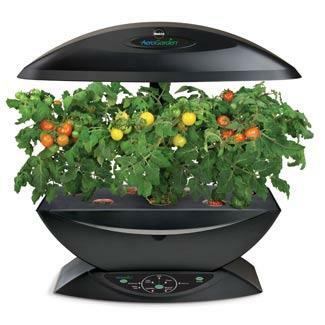 For handfuls of fresh basil, vine-ripened cherry tomatoes or fresh salad greens in the middle of winter, this is an ideal system for gardeners new to indoor growing. AeroGarden now offers more than 30 pre-seeded, “plug and grow” Seed Pod Kits, all tested and approved for our unparalleled “guaranteed to grow” warranty. Or build your own seed kits with our custom choices to enjoy varieties you'll never find in stores.